We went to Dudhsagar on the last day of our Goa trip. After having a talk with our hotel reception ( Book hotels online, in cheapest and safest way ), we booked a personal car which cost us 2,600/- approximately. We left our hotel at 8 am and reached Dudhsagar by 9:30 am. It is 47 km from Madgaon, Goa to Dudhsagar. Dudhsagar which means “sea of milk” is a four-tired waterfall located on Mandovi River in the border of Karnataka, India. It is one of the tallest waterfalls in India with a height of 1017 feet and with a width of 100 feet. 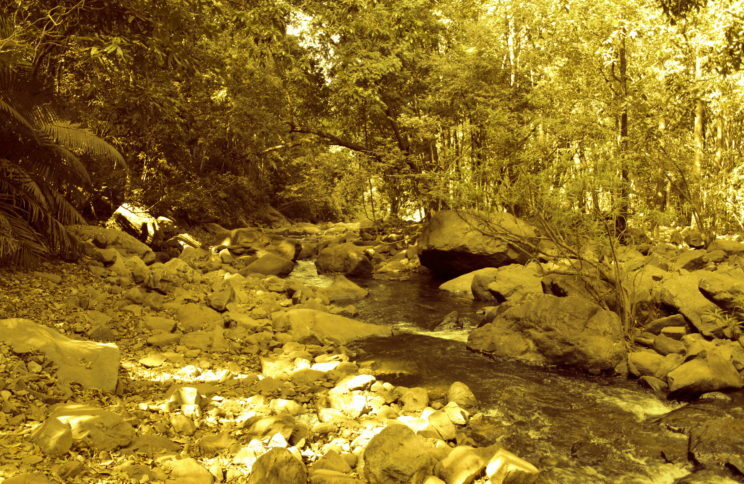 It is located in the Bhagwan Mahaveer Sanctuary and Mollem National Park in the Western Ghats. 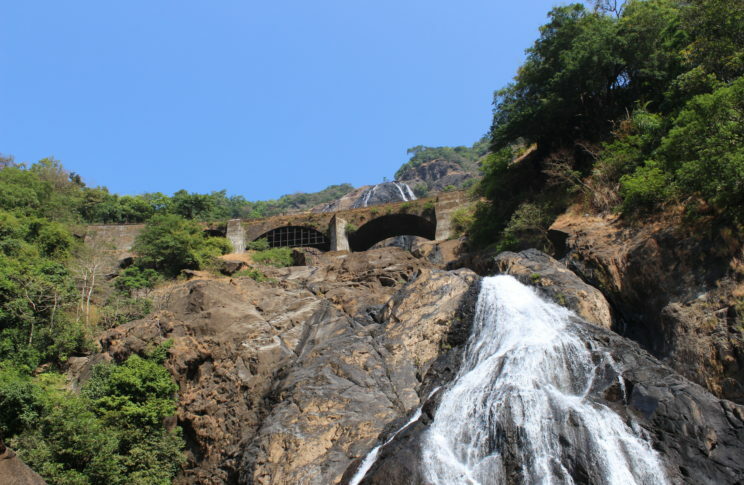 Dudhsagar falls forms a border between the states of Karnataka and Goa. Our car dropped us at the parking of Bhagwan Mahaveer Sanctuary; personal vehicles are not allowed inside the sanctuary and therefore, it is mandatory to travel the next 9 km by the jeeps provided by the sanctuary authorities. After spending few minutes in the queue we were able to book our jeep and then rent the life jackets which are again mandatory. The jeep charged us 500/- per head, life jackets was of 30/- per head and entry fee was 20/- per head. The jeeps are hired on a share basis and it takes maximum of 7 people. One can also hire the entire jeep which will cost around 2100/-. The 9 km ride in the jeep through the mountains was breath taking. I can not do justification to the beauty through my writing. There were places where the jeep had to cross the water which made me awestruck. You can check our guide to cheapest bus booking. The sanctuary is a home to a large variety of flora and fauna. There is a lot of greenery anywhere you look and It made me remember one of my childhood’s favorite book “The Jungle Book“. Unfortunately we could not see any animals in the sanctuary. After that the jeep dropped us and from there it was a walk of 15-20 minutes before we reached the falls. Each jeep has a permission to stay for 90 minutes at the falls; so, you have to be back within the time or else they would charge you extra. The 15-20 minutes walk in the woods gave us an mesmerizing feeling. I was completely lost until a monkey stopped my way. When I looked around, I saw lot of monkeys. Finally, we reached the falls. The milky white falls was before us at its best. It is a huge falls and the cold water gives a refreshing feeling. At once we jumped into the water with our life jackets on without a second thought. The view of the train passing the falls is great and reminds you of Shah Rukh Khan’s “Chennai Express“. The rest of the time I spent sitting on the rock and admiring the falls and thinking how can something be so beautiful? We went back to our jeep within the stated time and on our way back we saw few tribal people making Kaju Feni (Cashew Liquor) which are exported outside the country. The jeep dropped us at our pickup point and from there our car took us back to the hotel after having lunch on our way back. 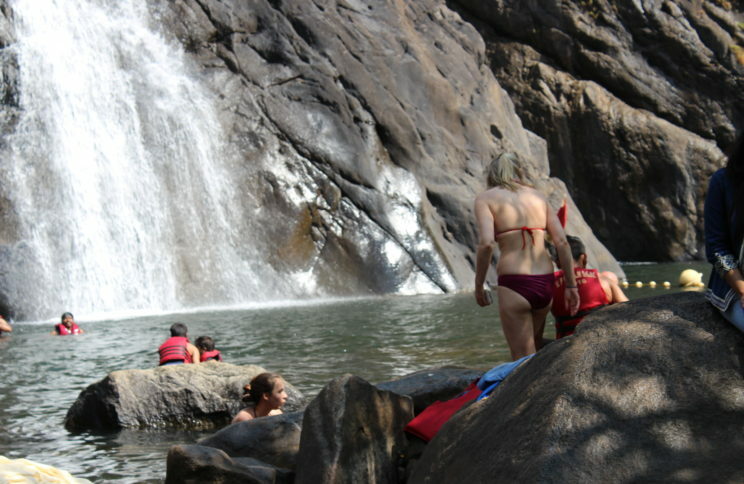 Dudhsagar is a 4.5 – 5 hours day trip and we recommend everyone to put it in your list whenever you plan a trip to Goa. The best time to visit Dudhsagar falls is during the rainy months. 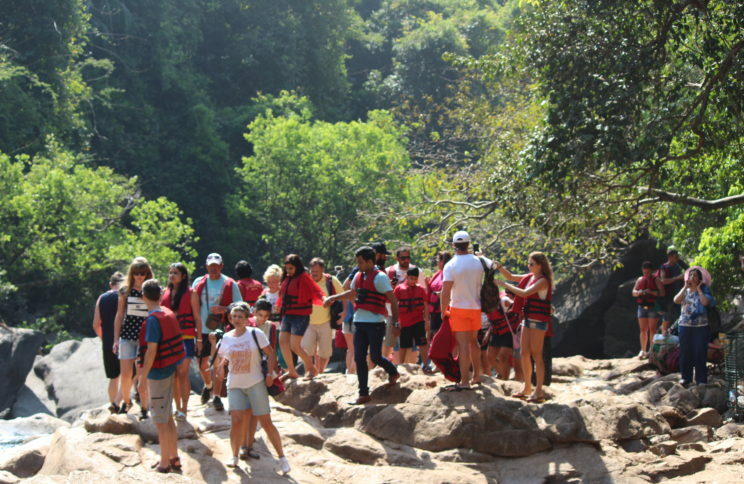 P.S.- No changing rooms are available near the falls, so think before getting completely wet. Government has built changing room in Collem Village so one can use it if needed. You can also reach Dudhsagar by train. There is no direct train, so, from Madgaon you can take a train to Londa Junction and from there a train to Kulem or Castle Rock. For train timings it is better to check with IRCTC. If you are going to Dudhsagar from goa , then you may check the best places in south goa or the awesome beaches in Goa . Carry an extra set of clothes, just in case you decide to get down in the water. Carry water bottles, beverages and snacks as you won’t get anything inside the sanctuary. It’s better to wear sport shoes or sneakers as you have to walk down a rock way.